We’re now in Week 15 of the NFL season. To help prepare, here’s my weekly look at the top starts and sits for fantasy football players in IDP leagues. The fantasy playoffs are heating up and chances are if you’re reading this article your IDP team is still alive. If you are reading this and have your IDP team has been eliminated…well… thank you for your loyalty and we’ll get’em next year! It’s all on the line as we head into Week 15 and after many hours of research as well as cups of coffee, here are this week’s start/sit options. The sack streak for Jones has now reached nine games (a single-season record since sacks began being tracked in 1982) and he is currently putting up top-10 fantasy totals on the season. In the past three games, Jones has posted 13 total tackles along with four sacks, and he is second on the team with 53 total quarterback pressures in 2018. Jones has a favorable matchup Thursday night in a division showdown with the Chargers. Let’s ride the hot hand here, as Autry was a Week 14 start selection that paid off. Autry has been a one-man wrecking crew for the Colts of late, putting up six sacks, two forced fumbles, and a fumble recovery in the last four weeks. The matchup against the Cowboys is a positive one for Autry to continue to shine. Dallas has been very generous fantasy-wise when it comes to defensive linemen over the past five games. In that time, defensive linemen have 92 total tackles, 17 sacks, and four forced and two recovered fumbles. In a prime matchup last week Heyward came up flat, posting six total tackles with no splash plays. Heyward is mired in a slump that has seen him produce just half a sack and 13 total tackles in the past three games. The Patriots are not an offense likely to present the opportunity for a bounceback performance. Through 13 games, New England has allowed only 18 total sacks and just seven to the defensive line position. There are better options than Heyward at this critical point in the fantasy playoffs. This is a shift in direction, as I’ve recently been advocating starting defensive linemen against a banged-up Detroit offensive line. Matthew Stafford was battered by the Rams defense in Week 13 to the tune of four sacks, six quarterback hits, and 19 total pressures. Last week against Arizona, Stafford was getting rid of the ball quickly on slants and flat routes, averaging just 4.4 yards per attempt. This led to the Cardinals being credited with just a single quarterback pressure. Hughes has been trending in the wrong direction with just four total tackles in the past two games. The Texans have been a plus matchup for linebackers with both Darius Leonard and Anthony Walker posting double-digit tackles in the Week 14 loss to the Colts. Leonard also had a sack in that game. Houston averages 31 rush attempts per game and has seen nine linebackers reach double-digit tackles against the team since Week 4. The Texans have allowed 13.5 sacks and another nine splash plays to linebackers. With Darron Lee suspended, Williamson has a prime matchup to post top-10 fantasy totals. We love linebackers from the Big Apple this week for fantasy purposes. 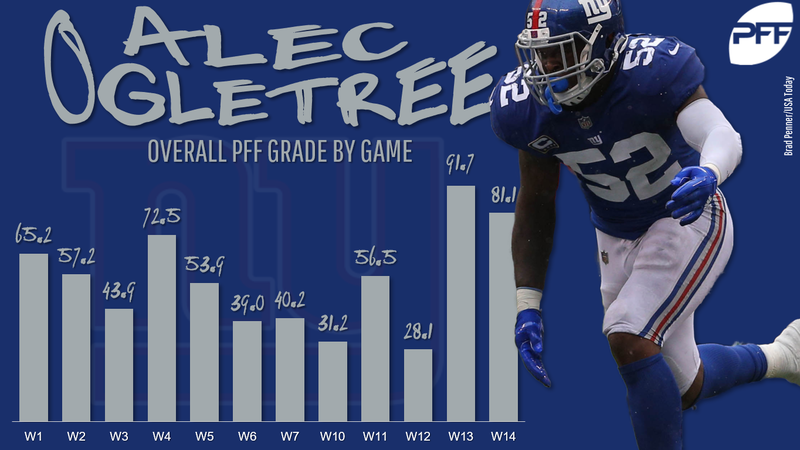 After a slow start to the 2018 season, Ogletree is one of the hottest linebackers for fantasy purposes, getting it done in all facets of the game. In his past four games Ogletree is posting top-five linebacker numbers with 31 total tackles, at least eight in three games. Ogletree’s splash-play numbers have been very impressive in that time as he’s put up a sack along with four interceptions and two defensive touchdowns. Last week against the Titans, Myles Jack and Telvin Smith combined for 23 total tackles and a sack. The combination of a tough matchup and the emergence of rookie Roquan Smith are the main reasons Trevathan can safely be benched in Week 15. A quick look at the last three games shows that Trevathan has 20 total tackles with no splash plays (he hasn’t had one since Week 4). In that same three-game stretch Smith has 27 total tackles, a sack, and an interception. Over the last five weeks the Packers are allowing just 16.6 total tackles per game to linebackers and just 2.5 sacks in that time to the position. In the Week 1 meeting between the teams, Trevathan had seven total tackles with no splash plays. This is the second player in Week 15 to have been selected as a Week 14 start option to earn (or not earn) a sit designation (Cameron Heyward is the other). The veteran Woodyard managed just one solo and six total tackles in a prime matchup against the Jaguars last week. The veteran is mired in a slump in which he’s put up four solo and 20 total tackles in the past three games. There has also been a dip in Woodyard’s snap count of late as he’s gone from being mainly a three-down player to having played just 73% of the defensive snaps in the past two weeks. The Cowboys safety has been a matchup-based fantasy option and I suggested starting him in a positive one in Week 12 against the Redskins. Heath responded with a line of 8/1/9 with one forced fumble. This is a matchup too good to pass up for Heath who has played a whopping 303 snaps either in the box or along the defensive line in the 2018 season. The trio of Kareem Jackson, Tyrann Mathieu, and Justin Reid combined for 26 total tackles last week against the Colts. In the past three games, Indianapolis has allowed 87 total tackles, a sack, and four interceptions to defensive backs. Let’s ride the hot hand here as Randall has been on a tear over the last three games. In that time, he has racked up 18 solo tackles and has two interceptions. The tackle numbers are impressive as Randall has been manning the free safety position for Cleveland and has line up in the box or on the defensive line just 73 times this season. Look for Randall to post numbers similar to the ones D.J. Reed of the 49ers hung on the Broncos in Week 14. Reed finished the game with 12 (10 solo) total tackles, a sack, and a forced fumble. There’s no doubt Jackson has been on a roll with three interceptions in the past four games and two defensive touchdowns in the mix. Those are gaudy numbers. But a closer look at Jackson reveals how big-play dependent he is as a fantasy option. In those four games Jackson has only 10 total tackles and is currently putting up DB3 fantasy numbers on the season in standard scoring. In their last five games, the Packers have allowed just one splash play and that was a sack. It’s too risky to roll out Jackson, who had just two tackles in the Week 1 meeting between the teams. The rookie safety has filled in admirably for Justin Evans (toe) and was particularly effective in Weeks 11-12, when he posted 17 solo and 19 total tackles. Unfortunately, over the last two games Whitehead has managed to put up just 10 total tackles despite playing 83% of the snaps. To date in 2018 Whitehead has also failed to produce a splash play and things won’t get easier in a matchup with Baltimore. In the last three games the ravens have allowed 68 total tackles and two splash plays to defensive backs.